So, it’s been almost two months since I updated this blog, and I have good reasons for that. A family health crisis had my mind focused on other matters, for one thing, and still does, although I have learned to live with it and continue to do what I do best-or at least, enjoy the most-as a means of getting through it and as a tribute to all those involved. My family is a strong clan and we stick together. For most of February, I worked on converting my graphic novel Dot’s Journey into a play script, to be performed as a sort of radio/reader’s theatre piece, with minimal staging and no props. The result differs considerably from the original, but I expected that. Without the visuals to make the story entertaining, I had to concentrate on the dialogue, which is all most plays have to work with, and in order to develop it, I needed to dig more deeply into the personalities and backgrounds of the various characters, especially the top three, who correspond to the Scarecrow, Tin Man, and Cowardly Lion. I made some changes that I wish I’d thought of when I was doing the original work-for example, a significant plot point is connected with a pair of flashy pumps worn by the Dorothy character, or Dot. In the graphic novel, the shoes are there, but they play no part in the narrative. Also, the ending is different. But if you want to know how different, you need to read the graphic novel and then come and see the dramatization. I presented the script to the owners of a local theatre/art gallery, for possible production later this year, and now I’m keeping my fingers crossed. 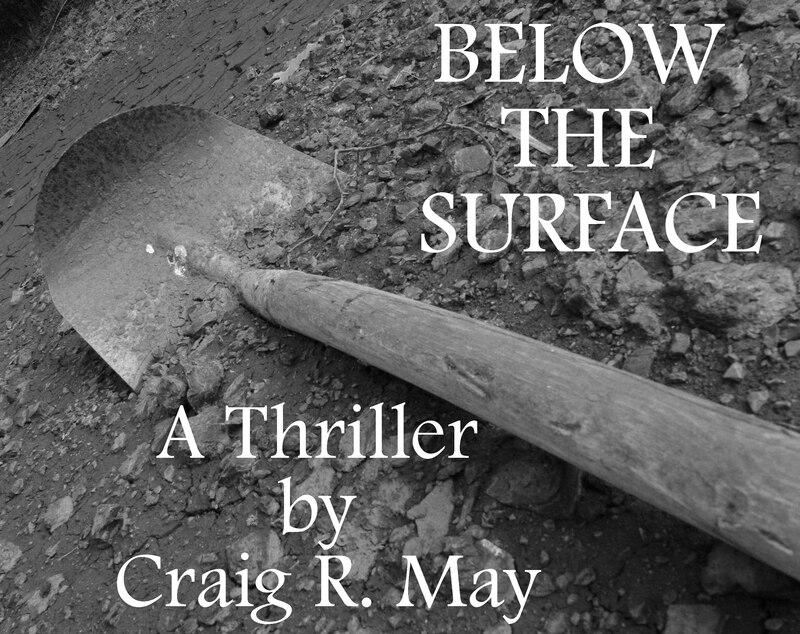 Aside from that happy development, I have begun pre-production on my project for ReadFlicks, my first commissioned work. Originally, this was to have been an adaptation of Dracula in the style of Dot’s Journey and Echo Forest, with miniatures and sketches and stock photos, but for reasons too complex to go into here, I decided to postpone that idea and instead work on an original concept of mine, titled The Pack. This is something of a homage to Hitchcock (not that a lot of my work isn’t), having been inspired by at least two of his films-The Lodger and Rear Window. There will also be overtones of Roman Polanski’s thriller The Tenant and Fritz Lang’s M. The plot focuses on a young music teacher who moves to a decrepit boardinghouse in the suburbs of New York City, circa 1935, in order to rebuild his life after a scandal which caused him to resign from his position at a conservatory in the city. Subplots will abound as the other occupants of the boardinghouse gradually reveal their own hidden agendas and scandals, and the climax will involve a vigilante murder attempt on the hero by his fellow tenants. There is a LOT of potential in this story to utilize all my trademark elements-noirish lighting, silent-film ambience, Gothic architecture and sets, gallows humor. I do plan to realize the piece as I did the two similar previous ones, using a small curio cabinet as a means of creating the “set” for the boardinghouse that is central to the story, with three-dimensional setups in the various shadowboxes, representing the various rooms. Scenes will be photographed using this, and the pictures will be combined with pen-and-ink sketches and stock photography, for a multimedia look, alongside the dialogue spoken by the characters. I am excited about this one…truly excited. I plan to take my time with the project and develop it fully, as I feel I owe that to myself and to the creator of ReadFlicks, in order to produce a deeper and more arresting illustrated narrative than ever before in my first “professional” assignment. Throughout March, I diverted myself with a purely fun project-puppetmaking. I have always been a huge fan of figurines, and have made more than my share for use in my artwork and storytelling, but I had never attempted to make a puppet before. So I started with one based on Mr. Teeth, the character I created (and played) in a silly short film last summer. 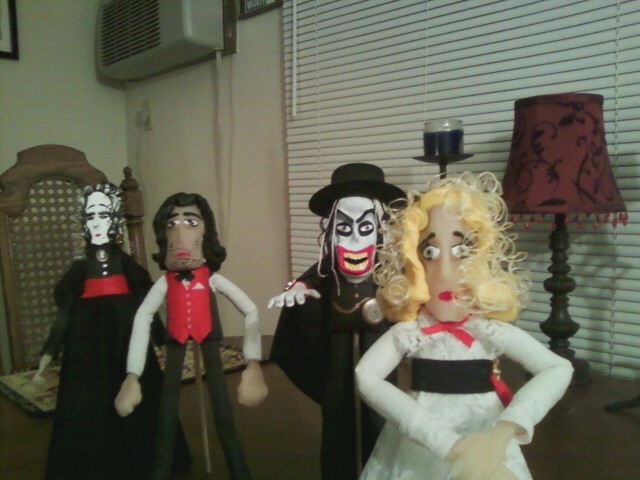 The challenge was to create these puppets without having to sew, as I never picked up that skill. Pat Catan’s, my local craft store, saved me-they have several sizes of stuffed doll bodies with wire armatures for fifty cents apiece. I just used a permanent fabric marker to color the muslin, made the heads and hands out of Sculpy, and made the “real” clothes out of lace and rayon-fabrics which wouldn’t fray. I had a ball. And of course, these four characters can’t just be allowed to languish in boxes in my closet, so I would like to eventually write a play around them, to be presented to the young and the young at heart. Four characters in search of an author. Their appearances alone make the story possibilities endless. This entry was posted on Wednesday, April 4th, 2012 at 6:32 pm	and posted in In The Works. You can follow any responses to this entry through the RSS 2.0 feed.